Is internet piracy killing the magician's trade? Magic is experiencing something of a renaissance. Its online communities are thriving as wannabe Derren Browns rub shoulders with professionals. Once-struggling magic shops are thriving in new online incarnations as amateurs flock in to impress their friends or branch out into a lucrative new career. Magicians themselves have even begun producing their own material for sale. On the surface, then, everything seems rosy in the world of the mystery arts. But magic relies on secrets, and one thing the internet can't keep is a secret. For some professionals, the internet has given rise to a new fear – that of coming across a heckler who has seen how the trick is done on YouTube and is determined to ruin it for everyone. Hang out with magicians for long enough and eventually the twin problems of internet exposure and piracy come up: "It is not a victimless crime," says magician Stephan Ward, speaking about magic piracy. "Many of the creators rely on sales of their products to earn a living. There are a couple of examples where the creator cannot perform shows any more due to health reasons, so he's decided to make his secrets available to other performers. This makes the theft even more wrong." The internet has transformed the magic scene into a multimillion pound industry, but life online has been both a blessing and curse for its practitioners. "I tend to work more on the corporate circuit now," says Ward, "but when I do perform at a bar or restaurant I've had the problem of people either looking things up on their phone while you do the trick, or telling you they saw it on YouTube." Rich Newman is a semi-professional magician who appears regularly at Bristol's Illusions Magic Bar. "I've never had someone actually find what I'm doing on YouTube while I'm at the table," he says, "but certainly afterwards I've had people come up to me and say 'Is this right? Is this what you did?' You have to use the old magician's trick and say, 'Can you keep a secret? Well, so can I!' You have to keep schtum." "I have a number of friends who are table workers," adds Paul Brook, a mindreader from Birmingham. "One of them went around the tables performing at a wedding recently and did a certain trick which is an astonishingly visual thing to see, but when he moved onto the next trick, someone at the same table had typed something into their iPhone and on YouTube there was the explanation. So he showed it to everyone while the guy was still working." Brook has spent time investigating the quality of YouTube exposure videos and isn't impressed: "With YouTube, you won't be getting the whole trick. You get the bare bones and you won't look good performing something you learn on there." Falling prices also mean that very small magic companies and even individuals can now produce professional DVDs for other magicians at a reasonable cost. But just like other forms of digital media, these discs are also difficult to protect from copying, as one prominent figure in the UK mentalism scene has discovered. "My own DVD had been pirated within a week of its release and after only nine sales, all of which were to people I knew," says Dr Todd Landman, cofounder of Psycrets: The British Society of Mystery Entertainers, and organiser of the society's bi-annual Tabula Mentis conference. "As a result my new book project is printed and secretly marked, and available in hard copy only to avoid ebook file sharing," he says. 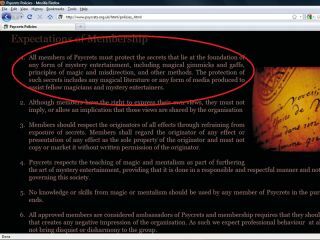 Piracy and exposure can even bar well known performers from entry into magic societies: "Our rules forbid members from engaging in exposure," says Dr Landman. "In fact we denied entry to a top mentalist from Canada who has openly exposed crucial secrets of our craft online." Current page: Is piracy killing magic?